There is much to appreciate about Ridley Scott’s “The Martian,” but a lot of it has to do with turning out better than many people expected. The premise — essentially “Cast Away” on Mars — doesn’t exactly scream for mass approval. Yet “The Martian” succeeds at hitting a series of satisfactory beats, combining hard science with spectacle and a charismatic lead far better than most Hollywood productions made on its scale today. However, its competence pales in comparison to the welcome surprise of another entry in the science fiction genre quietly surfacing at film festivals this fall. Still without U.S. distribution or much buzz, it would be lucky to receive the fervent anticipation allotted to one frame in the next “Star Wars” trailer. But it deserves at least that much, if not more. 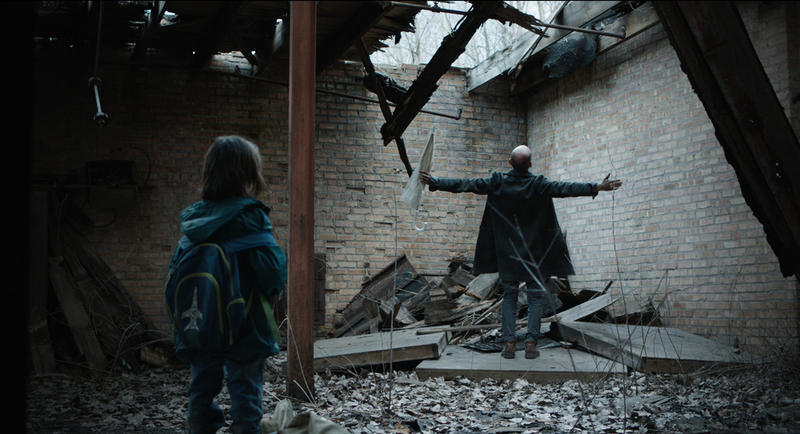 “Embers,” which envisions a post-apocalyptic world in which survivors have been stricken with short-term memory loss, snuck into festival lineups at Oldenburg, Chicago and New Orleans this past month (it won best narrative feature at the latter gathering, where — full disclosure — I served on the jury). The directorial debut of New York-based filmmaker Claire Carré, “Embers” has a sneaky appeal on par with its unexpected arrival on the scene. An elegant, brooding drama with a sprawling international cast, the movie presents its haunting premise with barely any explanation, leaving viewers to steadily make sense of the chaos along with the confused protagonists. At the center of the movie is a heartbreaking romance featuring a wandering couple (Iva Gocheva and Jason Ritter) who wake up each day unfamiliar with each other or their surroundings. With only a bracelet tying them together, the pair assume they have some kind of romantic bond, but they’re seemingly fated to repeat that struggle each day. It’s a touching scenario that suggests the nuanced relationship chatter of Richard Linklater’s “Before” trilogy by way of “Memento.” Their wanderings unfold with delicate exchanges shot against an impressive backdrop of tattered buildings and empty landscapes. It’s not an unfamiliar universe — think “Mad Max” with more urban decay — but Carré infuses it with wondrous existential yearning. While the minimalist romance comes and goes, “Embers” offers a series of other beguiling scenarios: A wise scientist sifts through his notes day after day, at once grasping his conundrum and regularly losing track of it; a young boy drifts through the woods, stuck in a mental loop that finds him muttering nonsense and running around in circles; a demented man runs wild through the tattered streets, psychotic with rage, though he can’t figure out why. Shot with a slick, grey-toned quality in convincingly empty outdoor scenery, these scenes maintain a sense of loss divorced from rationality. As a whole, “Embers” features a fragmentary look at the abstract struggle to make sense of emotions and places that resonate even when words fail. Despite the underlying tragedy of these circumstances, Carré (who co-wrote the script with Charles Spano) suggests an inherent warmth to her characters’ tender struggles, which contain an innocence that deepens as we witness each victim fight through another confounding day. The movie’s other main storyline focuses on a young woman named Miranda (Greta Fernández), whose wealthy father has trapped her in an underground bunker where the pair retain their memories. Each morning, Miranda answers questions from a robotic security system designed to ensure she has not been infected with the disease. With time, however, her mounting boredom implies she wants the opposite — to feel alive, even if doing so comes equipped with eternal disorientation. Such motivations are among the transfixing possibilities that “Embers” explores in a plot filled with little mysteries that speak to the larger one in play. Much as “Ex Machina” probed the mysteries of artificial intelligence earlier this year, “Embers” pokes at the real deal from the inside out. While far from perfect — juggling so many mini-scenarios, it falls short of making them cohere — it’s a startlingly accomplished first feature. With each gentle exchange or flustered look, “Embers” develops a smart perspective on the process of being disconnected from the world and struggling to comprehend it.